We don’t know about you, but the first three months of the year has seemed like total chaos, much stress and lots of brainpower being exerted. Not a lot fun, just a lot of Things We Have To Do. We were lucky to run off to New Orleans for a week of fun and food, only to come back to the routine. Holiday Blues commenced almost immediately. But we believe that sometimes, it’s the little things, the little changes you make to your life that make a huge impact. Changing your route to work, going out on a Monday, having breakfast for dinner, telling a stranger you like their shoes, being spontaneous. For us – of course! – this also means picking up an ingredient at the supermarket that we wouldn’t normally buy. Well, we actually bought two things. The first thing was the Ocado Veg box with lots of different veg. Full disclosure – we have no idea what to do with celery. Or 10 red onions (apart from onion soup). Or chard. So we’ve been forced to think outside of our comfort zone – always a good idea. The second thing we bought was Alphonso mango puree. Growing up in Delhi, Alphonso mango season was a very big deal. Almost every restaurant put on a mango festival where they came up with creative uses for the fruit in sweet and savoury dishes, and even cocktails. And for good reason too – the season is very short (so you have to make the most of it) and Alphonso mangoes are the best mangoes in the world (in our humble opinions). 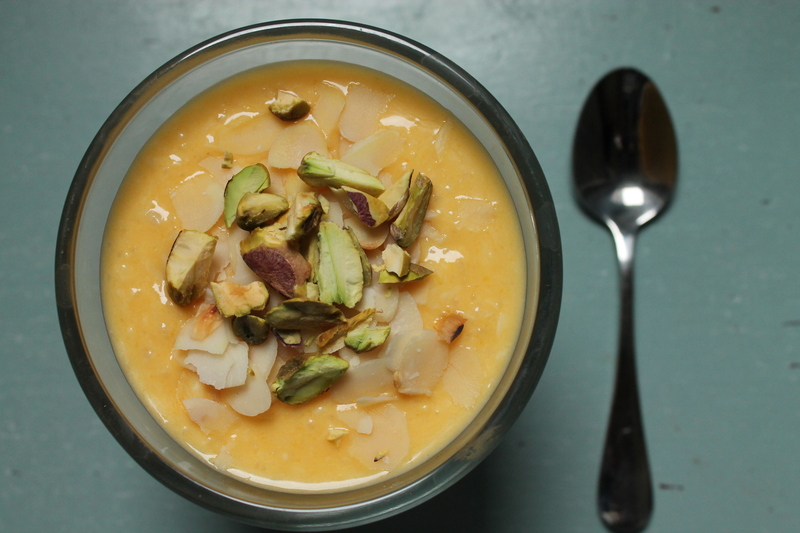 So when we saw a tin of Alphonso mango puree in Waitrose earlier this month, we just had to have it. We didn’t exactly know what we would do with it – there were too many options. At one point we were eating it from the can. 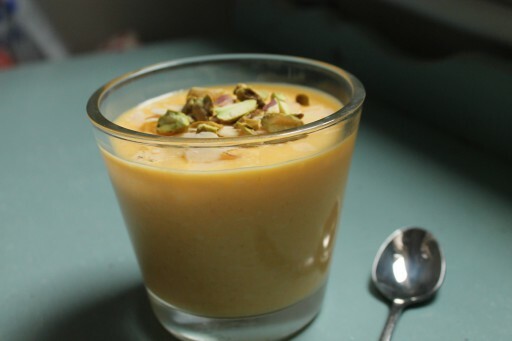 Then we remembered mango kheer, a sweet Indian rice pudding we’ve had every New Year for the past couple of years in Dubai. It’s creamy and comforting and makes you feel like you’re in some beautiful tropical climate, especially if you add coconut (our favourite thing in the world)! And there’s like fruit in there, right? It’s totally healthy. In a large, heavy-based pan, add the rice, milk, water and coconut. Cook on medium heat until boiling, then turn heat down to a simmer. Simmer for 15-20 minutes until cooked, but not supersoft/falling apart/mushy. Add the sugar (and a bit more if you’d like), kesar essence and cardamom essence. Stir thoroughly so that it is fully incorporated. Take the pan off the heat and leave aside until it is lukewarm. Add a tablespoon of mango pulp at a time, and mix thoroughly. Leave it to chill in the fridge (love puns!). Enjoy – you could even sprinkle chopped pistachios and almonds to make it look fancy (like we did! ).